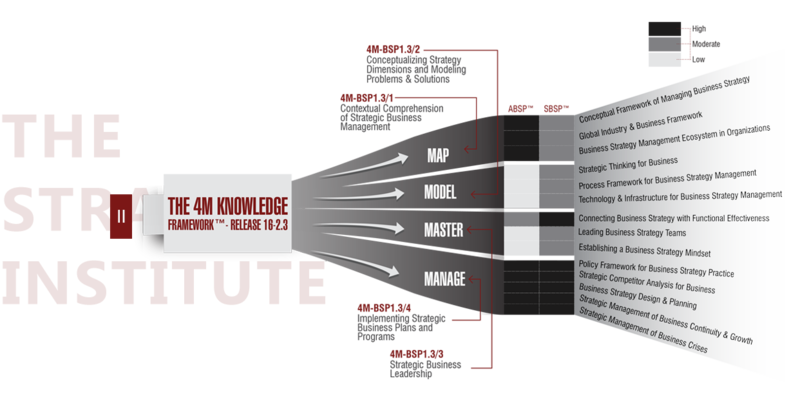 The 4M- Business Strategy Practice (BSP) Knowledge Grid of The Strategy Institute is the world’s most advanced framework of its kind for business, management, and industry professionals to build and validate their business strategy competence on. All our credentials are based on exams compliant to the 4M-BSP Knowledge Grid Release 16.1.3. This grid enunciates 14 areas across which The Strategy Institute divides business strategy knowledge as required by professionals. The obviously practical-sounding Map-Model-Master-Manage rubric – 4M as we call it - summarizes very well the fact that we treat business strategy as an area, the knowledge and understanding in which is absolutely essential-to-have for all professionals – their level of work or experience notwithstanding. In fact, research over the last several years has proven without doubt that business and management students with a better business strategy mindset tend to not only become more attractive for large employers, they also enjoy a much higher probability of getting richer roles at the start and of rising faster through the ranks in their career. The invention of the 4M-BSP grid by The Strategy Institute has now made installation of a new global regime of business strategy practice possible – one, in which the convenience of applying business strategy thinking in resolving decision challenges in functional management roles is specially stressed. The 4Ms of this model - Map-Model-Master-Manage – define the mission critical dimensions in which managers and leaders need to work to apply business strategy successfully for solving routine and strategic problems. While Mapping refers to the stage of studying, sizing-up and measuring both, challenges & opportunities and their environments; Modeling is about thinking up, designing and building solution-options, frameworks etc. that businesses and organizations need to succeed. The 3rd M or Mastering is dedicated to leading and guiding teams and talents on Business Strategy application to problems. Manage is about effective execution of the business strategy thought and process to get things done. The Body of Knowledge defining the mechanism of credentialing for the three certifications is fleshed around the 4M-BSP Knowledge Grid. Called the 4M-BSP Body of Knowledge, this also enunciates the structure, content, and policies of certification exams. 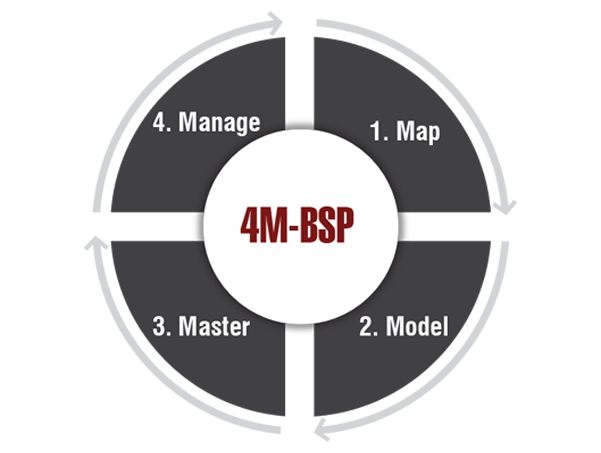 The 4M-BSP grid encapsulates 14 themes of critical managerial attention and learning, split across the 4 Ms – making it very convenient for recruiters to understand the knowledge they should be looking for in job-applicants. That is exactly why, the 4M-BSP-based credentials of The Strategy Institute become a highly effective recruitment- and mobility- decider tools for organizations. The Business Strategy Learning Suite – the kit for exam preparation – too, has been written in accordance to the stipulations of the 4M-BSP Body of Knowledge. It is given free to every individual registered for a certification of The Strategy Institute.